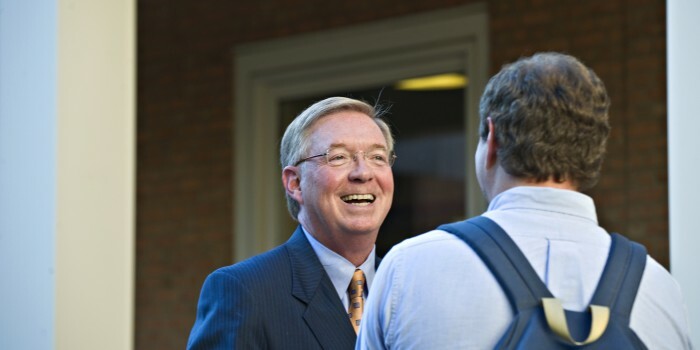 Wake Forest University welcomes Brad Wilson (JD ‘78) as executive in residence with the School of Law and the School of Business. He will begin on Aug. 1, 2018.Wilson is the retired president and CEO of Blue Cross Blue Shield of North Carolina (BCBSNC). He joined BCBSNC in 1996. Before he became president and CEO in 2010, he served in a variety of leadership positions with the organization, including executive vice president, general counsel and corporate secretary. He also served as general counsel to former North Carolina Gov. Jim Hunt and as a member and then chair of the UNC Board of Governors. He was the recipient of the Order of the Long Leaf Pine, the highest civilian award in the state. At Wake Forest, Wilson has served on the law school’s Board of Visitors. A lifelong North Carolinian, Wilson holds a bachelor’s degree from Appalachian State University and a master’s degree from Duke University, in addition to a law degree from Wake Forest.